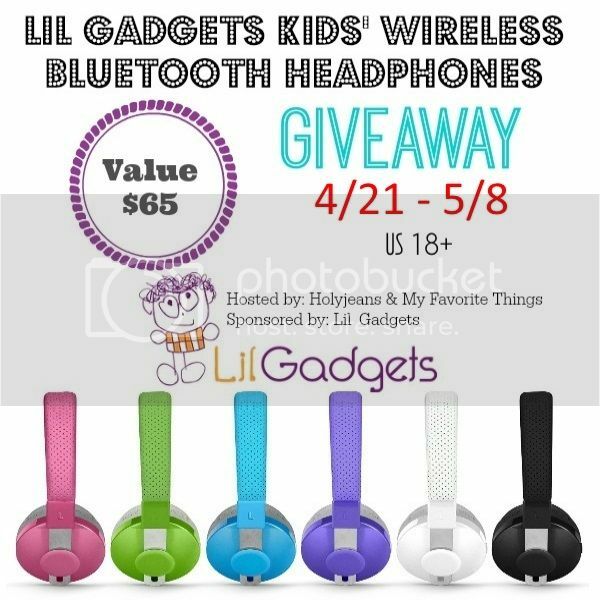 Welcome to the Lil Gadgets Untangled Pro Headphones Giveaway. I am very excited to be teaming up with Holyjeans & My Favorite Things and several other bloggers to bring you this fun giveaway. My girls are always asking if they can use my $100 Bose headphones. These would be perfect for them. Especially my 7 year old! The participating/promoting bloggers were not compensated for this post and are not responsible for prize fulfillment. Prize fulfillment will be completed by Lil Gadgets. One winner will be randomly chosen randomly and notified via email by Amy of Holyjeans & My Favorite Things. No purchase necessary to win. Void where prohibited by law. The giveaway will run until 05/08/2015 at 11:59pm CST. The giveaway is open to United States residents (ex. HI, AK) only. You must be over 18 years of age and you guarantee that you are eligible by entering. We reserve the right to cancel any giveaway. Winning entries are verified before winner is announced. No purchase is necessary. One entry per person per household. This giveaway is in no way sponsored, endorsed or administered by, or associated with Facebook. For questions contact Amy @ pnppowell09@gmail.com. I would choose black it goes with everything and can be for boys or girls,since I have both. I would choose the black one. So glad they make kids sizes. I would choose the green headphones for my grandson. I would pick the bluish purple ones. I would chose the green ones. Both my kids could use them. My daughter said she would love the pink ones. Thank you!! I would choose the white one if I won. I like the white ones best. Thanks for the chance. I'd choose the purple ones! My granddaughter wants the pink ones. I'd get the blue ones. These are adorable! My son would love the green pair the most. My daughter would probably want the pink ones! I would choose the purple ones.